Mike Tirico has handled a variety of assignments for ESPN, ESPN Radio and ABC Sports since 1991. 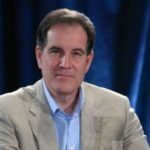 In 2006 he assumed the much-desired position as ESPN’s Monday Night Football play-by-play commentator, for which he garnered a Sports Emmy nomination. 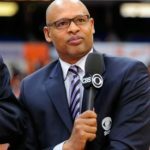 Tirico, who works alongside analysts Ron Jaworski and Tony Kornheiser, also serves as play-by-play commentator for NBA games on ESPN and ABC. Tirico has always been one of the industry’s most versatile sportscasters. 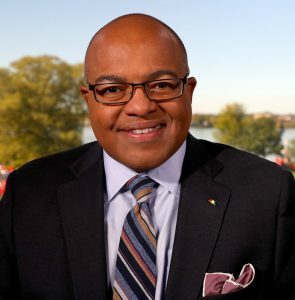 During 2005-06, Tirico called the Fedex Orange Bowl and the British Open golf championship in addition to co-hosting Super Bowl XL Pre-Game and Post-Game shows and NBA Finals coverage for ABC Sports. Tirico’s on-air responsibilities have included play-by-play duties for ESPN NFL games, Thursday and Saturday college football games, college basketball and NBA games for both networks including hosting NBA broadcasts on ABC and golf coverage on ABC. Tirico joined ESPN as a SportsCenter anchor in July 1991, later serving as host of Monday Night Countdown during the NFL season from that shows 1993 launch to 2001. 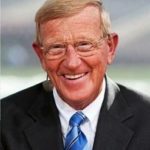 From 1993-1997, he was also the anchor of ESPN’s College Football Scoreboard show and on November 1, 1996, he hosted the debut of ESPNEWS. Tirico has hosted ESPN’s SportsCenter coverage of the U.S. Open, the Masters and the Daytona 500. 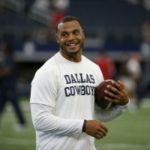 He has also anchored coverage of the Super Bowl, the NCAA Final Four and the NFL Draft for both television and radio. In 1998, he also appeared on Sunday NFL Countdown. In recent years, Tirico has largely left the studio and has focused on event coverage. In December 1996, he was named golf host for ABC Sports. He has worked college basketball and Thursday night college football telecasts for ESPN since 1997. 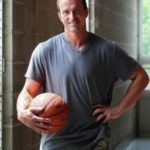 His NBA assignments commenced with the 2002â€“03 season, when ESPN and ABC acquired their extensive schedules, including the NBA Finals on ABC. Prior to joining ESPN, Tirico worked in Syracuse, N.Y., from 1987 to 1991. He was sports director at CBS affiliate WTVH-TV and play-by-play voice for Syracuse University basketball, football, lacrosse and volleyball for the Super Sports Network of Cook CableVision. In 1989, Tirico was named top local sportscaster by the Syracuse Journal. In 1987, he was the first recipient of the Bob Costas Scholarship, given to an exceptional broadcast journalism student at Syracuse.